Hematoxylin, the most commonly used nuclear dye, most commonly used natural dye, extracted from heartwood of the logwood tree which is native to Central America, made in USA! Nuclei, mitotic structure, mitochondria, mucin, hemoglobin, elastic fibers, muscle, collagen, axons, phospholipids, protozoa, fatty acids, myelin sheath, alpha and beta cells of the pituitary, pancreatic islets and also certain types of metal. Hematein is the oxidation product of hematoxylin. The conversion of hematoxylin to hematein is a process known as ripening which may be achieved naturally through exposure to air (Delafields hematoxylin). There are also chemical oxidants to hasten the ripening process, mercuric oxide, sodium iodate and potassium permanganate. PH will have effect on rate of oxidation. A neutral aqueous solution of hematoxylin will form hematein in a few hours. Alkaline solutions will affect for a more rapid oxidizing process. Acid solutions will affect for a more slow oxidizing process. Mordents- act as a link from the dye to the tissue. Aluminum and Iron are most commonly used, in some cases the mordant is also the oxidizer. For a stable solution the mordant chosen must be a non oxidizer, such as ammonium alum, phosphotungstic acid and phosphomolybdic acid. For a rapidly oxidizing short-lived and unstable solutions that only last up to 24 hours, mordents such as ferric chloride in Wiegerts hematoxylin and also ferric acetate or ferric alum are used. The combination of mordant and Dye is called a “lake”, in the hematein mordant combination lake there is a positive charge that functions as a cationic or basic dye, this is sometimes called a basophilic stain. 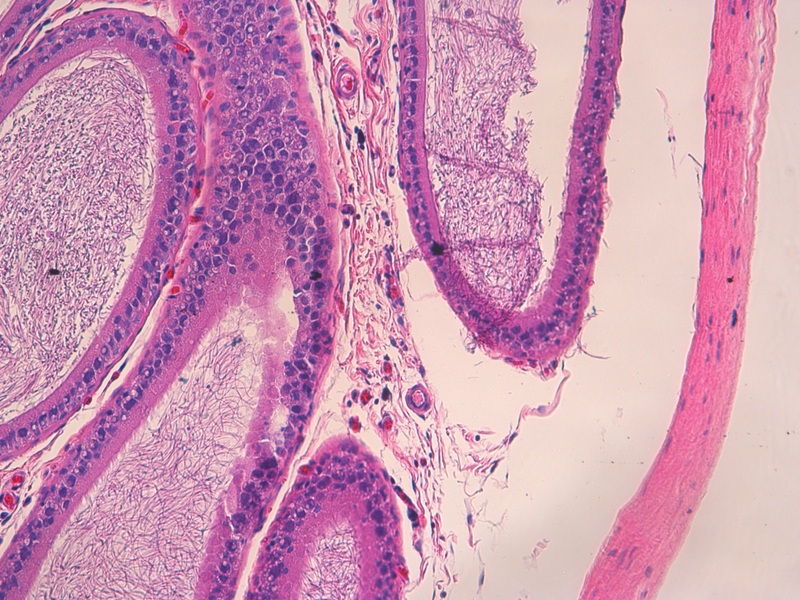 Previous post: What is Tissue Histology?